The inauguration of the President of the United States is a ceremony to mark the commencement of a new four-year term of the President of the United States. This ceremony takes place for each new presidential term, even if the president is continuing in office for a second term. Since 1937, it has taken place on January 20, which is 72 to 78 days after the November presidential election (on the first Tuesday after the first Monday in November). The term of a president commences at noon ("EST" – Eastern Standard Time) on that day, when the Chief Justice of the United States administers the oath of office to the president. However, when January 20 falls on a Sunday, the chief justice administers the oath to the president on that day privately and then again in a public ceremony the next day, on Monday, January 21. The most recent presidential inauguration ceremony was the swearing in of Donald Trump to a four-year term of office on Friday, January 20, 2017. Recitation of the presidential oath of office is the only component in this ceremony mandated by the United States Constitution (in Article II, Section One, Clause 8). However, over the years, various traditions have arisen that have expanded the inauguration from a simple oath-taking ceremony to a day-long event, including parades and multiple social gatherings. The ceremony itself is carried live via the major U.S. commercial television and cable news networks; various ones also stream it live on their websites. Since the 1981 inauguration of Ronald Reagan, the ceremony has been held at the west front of the United States Capitol facing the National Mall with its iconic Washington Monument and distant Lincoln Memorial. Other swearing-in ceremonies have taken place on a platform over the steps at the Capitol's east portico on a regular basis for 180 years, and occasionally inside the Old Senate Chamber on the old north side, the chamber of the House of Representatives in the south wing, and the central Rotunda under the dome. Additionally, on two occasions—in 1817 and 1945—they were held at the Executive Mansion, (later known as the White House). Though it is not a constitutional requirement, the Chief Justice typically administers the presidential oath of office. Since 1789, the oath has been administered at 58 scheduled public inaugurations, by 15 chief justices, one associate justice, and one New York state judge. Others, in addition to the chief justice, have administered the oath of office to several of the nine vice presidents who succeeded to the presidency upon their predecessor's death or resignation intra-term. When a new president has assumed office under these unusual circumstances the inauguration has been conducted without pomp or fanfare. The first inauguration, that of George Washington, took place on April 30, 1789. All subsequent (regular) inaugurations from 1793 until 1933, were held on March 4, the day of the year on which the federal government began operations under the U.S. Constitution in 1789. The exception to this pattern was those years in which March 4 fell on a Sunday. When it did, the public inauguration ceremony would take place on Monday, March 5. This happened on four occasions, in 1821, 1849, 1877, and 1917. Inauguration Day moved to January 20, beginning in 1937, following ratification of the Twentieth Amendment to the Constitution, where it has remained since. A similar Sunday exception and move to Monday is made around this date as well (which happened in 1957, 1985, and 2013). Inauguration Day, while not a federal holiday, is observed as a holiday by federal employees who work in the District of Columbia; Montgomery and Prince George's counties in Maryland; Arlington and Fairfax Counties in Virginia, and the cities of Alexandria and Fairfax in Virginia, and who are regularly scheduled to perform non-overtime work on Inauguration Day. There is no in-lieu-of holiday for employees or students who are not regularly scheduled to work or attend school on Inauguration Day. Most presidential inaugurations since 1801 have been held in Washington D.C. at the Capitol Building. Prior inaugurations were held, first at Federal Hall in New York City (1789), and then at Congress Hall in Philadelphia, Pennsylvania (1793 and 1797). Each city was, at the time, the nation's capital. The location for James Monroe's 1817 swearing in was moved to the Old Brick Capitol in Washington due to on-going restoration work at the Capitol building following the War of 1812. In 1909, William H. Taft's inauguration was moved to the Senate Chamber due to a blizzard. Three other inaugurations—Franklin D. Roosevelt's fourth (1945), Harry S. Truman's first (1945), and Gerald Ford's (1974)—were held at the White House. 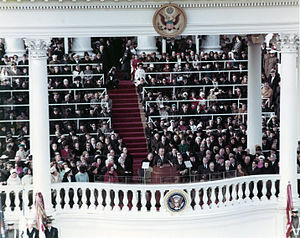 Presidential inaugurations (not including intra-term ceremonies following the death or resignation of a president) have traditionally been outdoor public ceremonies. Andrew Jackson, in 1829, was the first of 35 held on the east front of the Capitol. Since the 1981 inauguration of Ronald Reagan, they have been held on the Capitol's west front; a move designed to both cut costs and to provide more space for spectators. Prior to Inauguration Day, the president-elect will name a Presidential Inaugural Committee. This committee is the legal entity responsible for fundraising for and the planning and coordination of all official events and activities surrounding the inauguration of president and vice president (other than the ceremony), such as the balls and parade. Since 1901, the Joint Congressional Committee on Inaugural Ceremonies has been responsible for the planning and execution of the swearing-in ceremonies at the U.S. Capitol. Since 1953, the committee has also hosted a luncheon at the Capitol for the new president, vice president, and guests. The Joint Task Force National Capital Region, composed of service members from all branches of the United States Armed Forces, including Reserve and National Guard components, is responsible for all military support to ceremonies and to civil authorities for the inaugural period (in 2017, January 15–24). U.S. military personnel have participated in Inauguration Day ceremonies since 1789 when members of the Continental Army, local militia units and Revolutionary War veterans escorted George Washington to his first inauguration ceremony. Their participation traditionally includes musical units, color guards, salute batteries and honor cordons. Military support to the inauguration honors the new president, who is commander-in-chief of the armed forces, and recognizes civilian control of the military. In addition to the public, the attendees at the ceremony generally include the vice president, members of Congress, Supreme Court justices, high-ranking military officers, former presidents, living Medal of Honor recipients, and other dignitaries. The outgoing president customarily attends the president-elect's inauguration. Only five have chosen not to do so. John Adams, still smarting over the outcome of the election of 1800, did not remain in Washington to witness the inauguration of Thomas Jefferson, his successor. In 1829, John Quincy Adams also left town, unwilling to be present to see Andrew Jackson's accession to the White House. In 1869, Andrew Johnson was angrily conducting a cabinet meeting even as his successor, Ulysses S. Grant, was being inaugurated. More recently, Woodrow Wilson did not attend Warren G. Harding's 1921 inauguration (though he rode to the Capitol with him), nor did Richard Nixon attend Gerald Ford's 1974 inauguration (having left Washington, D.C., prior to his resignation taking effect). Inauguration procedure is governed by tradition rather than the Constitution, the only constitutionally required procedure being the presidential oath of office (which may be taken anywhere, with anyone in attendance who can legally witness an oath, and at any time prior to the actual beginning of the new president's term). Traditionally, the president-elect arrives at the White House and proceeds to the inaugural grounds at the United States Capitol with the incumbent president. Only three incumbent presidents have refused to accompany the president-elect: John Adams, John Quincy Adams, and Andrew Johnson. 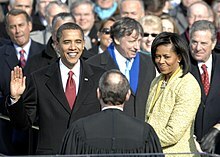 Around or after 12 noon, the president takes the oath of office, usually administered by the Chief Justice of the United States, and then delivers the inaugural address. Video of the first inauguration of Barack Obama. According to Washington Irving's biography of George Washington, after reciting the oath at his (and the nation's) first inauguration, Washington added the words "so help me God". However, the only contemporaneous source that fully reproduced Washington's oath completely lacks the religious codicil. The first newspaper report that actually described the exact words used in an oath of office, Chester Arthur's in 1881, repeated the "query-response" method where the words, "so help me God" were a personal prayer, not a part of the constitutional oath. The time of adoption of the current procedure, where both the chief justice and the president speak the oath, is unknown. The oath of office was administered to Washington in 1789 by Robert Livingston, Chancellor of New York State. Four years later, the oath was administered by Supreme Court Associate Justice William Cushing. Since the 1797 inauguration of John Adams, it has become customary for the new president to be sworn into office by the Supreme Court's Chief Justice. Others have administered the oath on occasions when a new president assumed office intra-term due to the incumbent's death or resignation. William Cranch, chief judge of the U.S. Circuit Court, administered the oath of office to John Tyler in 1841 when he succeeded to the presidency upon William Henry Harrison's death, and to Millard Fillmore in 1850 when Zachary Taylor died. In 1923, upon being informed of Warren Harding's death, while visiting his family home in Plymouth Notch, Vermont, Calvin Coolidge was sworn in as president by his father, John Calvin Coolidge, Sr., a notary public. Most recently, Federal Judge Sarah T. Hughes administered the oath of office to Lyndon B. Johnson aboard Air Force One after John F. Kennedy's assassination on November 22, 1963. Since 1789 there have been 58 inaugural ceremonies to mark the commencement of a new four-year term of a president of the United States, and an additional nine marking the start of a partial presidential term following the intra-term death or resignation of an incumbent president. With the 2017 inauguration of Donald Trump, the oath has been taken 75 different times by 44 people. This numerical discrepancy results chiefly from two factors: a president must take the oath at the beginning of each term of office, and, because the day of inauguration has sometimes fallen on a Sunday, five presidents have taken the oath privately before the public inaugural ceremonies. In addition, three have repeated the oath as a precaution against potential later constitutional challenges. There is no requirement that any book, or in particular a book of sacred text, be used to administer the oath, and none is mentioned in the Constitution. By convention, incoming presidents raise their right hand and place the left on a Bible or other book while taking the oath of office. While most have, John Quincy Adams did not use a Bible when taking the oath in 1825; neither did Theodore Roosevelt in 1901. In 1853, Franklin Pierce affirmed the oath of office rather than swear it. More recently, a Catholic missal was used for Lyndon Johnson's 1963 swearing in ceremony. Bibles of historical significance have sometimes been used at inaugurations. George H. W. Bush, Jimmy Carter and Dwight D. Eisenhower used the George Washington Inaugural Bible. Barack Obama placed his hand upon the Lincoln Bible for his oaths in 2009 and 2013, as did Donald Trump in 2017. Four ruffles and flourishes played before "Hail to the Chief"
Immediately after the presidential oath, the United States Marine Band will perform four ruffles and flourishes, followed by Hail to the Chief, while simultaneously, a 21-gun salute is fired using artillery pieces from the Presidential Guns Salute Battery, 3d United States Infantry Regiment "The Old Guard" located in Taft Park, north of the Capitol. The actual gun salute begins with the first ruffle and flourish, and 'run long' (i.e. the salute concludes after Hail to the Chief has ended). The Marine Band, which is believed to have made its inaugural debut in 1801 for Thomas Jefferson's first inauguration, is the only musical unit to participate in all three components of the Presidential inauguration: the swearing-in ceremony, the inaugural parade, and an inaugural ball. During the ceremony, the band is positioned directly below the presidential podium at the U.S. Capitol. Inaugural Address of President Donald Trump. The inaugural address, in full, made by Donald Trump after being sworn in as the 45th President of the United States on January 20, 2017. Newly sworn-in presidents usually give a speech referred to as an inaugural address. As with many inaugural customs, this one was started by George Washington in 1789. After taking his oath of office on the balcony of Federal Hall, he proceeded to the Senate chamber where he read a speech before members of Congress and other dignitaries. Every President since Washington has delivered an Inaugural address. While many of the early Presidents read their addresses before taking the oath, current custom dictates that the chief justice administer the oath first, followed by the president's speech. William McKinley requested the change in 1897, so that he could reiterate the words of the oath at the close of his first inaugural address. William Henry Harrison delivered the longest inaugural address, at 8,445 words, in 1841. John Adams' 1797 address, which totaled 2,308 words, contained the longest sentence, at 737 words. In 1793, Washington gave the shortest inaugural address on record, just 135 words. The Reverend Donn Moomaw delivers the invocation at the first inauguration of Ronald Reagan, 1981. Since 1937, the ceremony has incorporated one or more prayers. Since 1933 an associated prayer service either public or private attended by the President-elect has often taken place on the morning of the day. At times a major public or broadcast prayer service takes place after the main ceremony most recently on the next day. Over the years, various inauguration traditions have arisen that have expanded the event from a simple oath-taking ceremony to a day-long one, including parades, speeches, and balls. In fact, contemporary inaugural celebrations typically span 10 days, from five days before the inauguration to five days after. On some occasions however, either due to the preferences of the new president or to other constraining circumstances, they have been scaled back. Such was the case in 1945, because of rationing in effect during World War II. More recently, in 1973, the celebrations marking Richard Nixon's second inauguration were altered because of the death of former President Lyndon B. Johnson two days after the ceremony. All pending events were cancelled so preparations for Johnson's state funeral could begin. Because of the construction work on the center steps of the East Front, Johnson's casket was taken up the Senate wing steps of the Capitol when taken into the rotunda to lie in state. When it was brought out, it came out through the House wing steps of the Capitol. Since 1953, the president and vice president have been guests of honor at a luncheon held by the leadership of the United States Congress immediately following the inaugural ceremony. The luncheon is held in Statuary Hall and is organized by the Joint Congressional Committee on Inaugural Ceremonies, and attended by the leadership of both houses of Congress as well as guests of the president and vice president. By tradition, the outgoing president and vice president do not attend. Following the arrival of the presidential entourage to the White House, it is customary for the president, vice-president, their respective families and leading members of the government and military to review an inaugural parade from an enclosed stand at the edge of the North Lawn, a custom begun by James Garfield in 1881. The parade, which proceeds along the 1.5 miles of Pennsylvania Avenue in front of the stand and the Front Lawn in view of the presidential party, features both military and civilian participants from all 50 states and the District of Columbia; this parade largely evolved from the post-inaugural procession to the White House, and occurred as far back as Jefferson's second inauguration in 1805, when workers from the Washington Navy Yard, accompanied by military music, marched with the president on foot as he rode on horseback from the Capitol to the White House. By the time of William Henry Harrison's inauguration in 1841, political clubs and marching societies would regularly travel to Washington for the parade. That year was also the first in which floats were part of the parade. It was at Lincoln's second inauguration, in 1865, that Native Americans and African Americans participated in the inaugural parade for the first time. Women were involved for the first time in 1917. In 1829, following his first inaugural parade, Andrew Jackson held a public reception at the White House, during which 20,000 people created such a crush that Jackson had to escape through a window. Nevertheless, White House receptions continued until lengthy afternoon parades created scheduling problems. Reviving the idea in 1989, President George H. W. Bush invited the public to a "White House American Welcome" on the day after the inaugural. Grover Cleveland’s 1885 inaugural parade lasted three hours and showcased 25,000 marchers. Eighty years later, Lyndon Johnson’s parade included 52 select bands. Dwight D. Eisenhower's 1953 parade included about 22,000 service men and women and 5,000 civilians, which included 50 state and organization floats costing $100,000. There were also 65 musical units, 350 horses, 3 elephants, an Alaskan dog team, and the 280-millimeter atomic cannon. In 1977, Jimmy Carter became the first president to set out by foot for more than a mile on the route to the White House. The walk has become a tradition that has been matched in ceremony if not in length by the presidents who followed. Twice during the 20th century, an inaugural parade down Pennsylvania Avenue was not held. In 1945, at the height of World War II, Franklin D. Roosevelt's fourth Inauguration was simple and austere with no fanfare or formal celebration following the event. There was no parade because of gas rationing and a lumber shortage. In 1985, as temperatures hovered near zero, all outdoor events for Ronald Reagan's second inauguration were canceled or moved indoors. The obverse had been the case four years earlier for Reagan's first inauguration, as the noontime temperature was an unseasonable 55 degrees. That parade was held as breaking news spread across Washington, D.C. and the rest of the nation that the 52 American hostages held in Iran for the previous 444 days had been released. A tradition of a national prayer service, usually the day after the inauguration, dates back to George Washington and since Franklin Delano Roosevelt, the prayer service has been held at the Washington National Cathedral. This is not the same as the Inaugural Prayer, a tradition also begun by Washington, when on June 1, 1789, Methodist Bishops Francis Asbury and Thomas Coke, Rev. John Dickins, the pastor of Old St. George's (America's oldest Methodist Church) and Major Thomas Morrell, one of President Washington’s former aides-de-camp called upon Washington in New York City. This tradition resumed in 1985 with President Reagan and continues under the auspices of a Presidential Inaugural Prayer Committee based at Old St. George's. The first Inaugural Ball was held on the night of James Madison's first inauguration in 1809. Tickets were $4 and it took place at Long’s Hotel. The security for the inaugural celebrations is a complex matter, involving the Secret Service, Department of Homeland Security, Federal Protective Service (DHS-FPS), all five branches of the Armed Forces, the Capitol Police, the United States Park Police (USPP), and the Metropolitan Police Department of the District of Columbia (MPDC). Federal law enforcement agencies also sometimes request assistance from various other state and local law-enforcement agencies throughout the United States. Beginning with George Washington, there has been a traditional association with Inauguration festivities and the production of a presidential medal. With the District of Columbia attracting thousands of attendees for inauguration, presidential medals were an inexpensive souvenir for the tourists to remember the occasion. However, the once-simple trinket turned into an official presidential election memento. In 1901, the first Inauguration Committee on Medals and Badges was established as part of the official Inauguration Committee for the re-election of President McKinley. The Committee saw official medals as a way to raise funding for the festivities. Gold medals were to be produced as gifts for the president, vice president, and committee chair; silver medals were to be created and distributed among Inauguration Committee members, and bronze medals would be for sale for public consumption. McKinley's medal was simple with his portrait on one side and writing on the other side. Unlike his predecessor, when Theodore Roosevelt took his oath of office in 1905, he found the previous presidential medal unacceptable. As an art lover and admirer of the ancient Greek high-relief coins, Roosevelt wanted more than a simple medal—he wanted a work of art. To achieve this goal, the president hired Augustus Saint-Gaudens, a famous American sculptor, to design and create his inauguration medal. Saint-Gaudens's obsession with perfection resulted in a forestalled release and the medals were distributed after the actual inauguration. Nonetheless, President Roosevelt was very pleased with the result. Saint Gardens' design, executed by Adolph A. Weinman, was cast by Tiffany & Company and was proclaimed an artistic triumph. Saint-Gaudens' practice of creating a portrait sculpture of the newly elected president is still used today in presidential medal creation. After the president sits for the sculptor, the resulting clay sketch is turned into a life mask and plaster model. Finishing touches are added and the epoxy cast that is created is used to produce the die cuts. The die cuts are then used to strike the president's portrait on each medal. From 1929 through 1949, the official medal was struck by the U.S. Mint. This changed in 1953 when the Medallic Art Company was chosen to strike Walker Hancock's portrait of President Eisenhower. The official medals have been struck by private mints ever since. The Smithsonian Institution and The George Washington University hold the two most complete collections of presidential medals in the United States. The 58 inauguration ceremonies marking the start of a new four-year presidential term of office and also the nine marking the start of a partial presidential term following the intra-term death or resignation of an incumbent president are listed in the table below. ^ Events (Inaugurations) sort alphabetically by president's last name. ^ a b c d Term began Sunday, March 4. ^ Term began when President Garfield died on September 19. ^ Term began when President Harding died on August 2. ^ Williams, Brenna Williams (January 16, 2017). "Presidents change, Inauguration Day stays the same". CNN. Retrieved January 29, 2017. ^ "Federal, state, and local holidays". US Department of Commerce. Retrieved January 20, 2017. ^ "The 8th Presidential Inauguration: James Monroe, March 4, 1817". Joint Congressional Committee on Inaugural Ceremonies. Retrieved July 18, 2013. ^ "U.S. Presidential Inaugurations: William Howard Taft (Virtual Programs & Services, Library of Congress)". www.loc.gov. Retrieved April 8, 2017. ^ "The President's Swearing-in Ceremony". Joint Congressional Committee on Inaugural Ceremonies. Retrieved January 18, 2017. ^ "PIC records". National Archives. ^ a b c d "Inaugural Address". Joint Congressional Committee on Inaugural Ceremonies. Retrieved January 23, 2017. This article incorporates text from this source, which is in the public domain. ^ "JTF-NCR About Us". Archived from the original on December 7, 2016. Retrieved January 27, 2017. ^ "A History of the Presidency – Transitions". Retrieved January 15, 2017. ^ "June 14, 1922 Harding becomes first president to be heard on the radio". This Day in History. A&E Television Networks. Retrieved January 31, 2017. ^ Wallace, Tim; Parlapiano, Alicia (January 22, 2017). "Crowd Scientists Say Women's March in Washington Had 3 Times More People Than Trump's Inauguration". The New York Times. Retrieved January 22, 2017. ^ "Nielsen: 31 million viewers saw Trump's swearing-in". Washington Post. January 21, 2017. Retrieved January 27, 2017. ^ Edkins, Brett (January 24, 2017). "Record 6.8 Million Watched Trump's Inauguration On Twitter's Live Stream". Forbes. Retrieved January 25, 2017. ^ a b "Inauguration at the U.S. Capitol". Architect of the Capitol. Retrieved January 22, 2017. ^ a b c Terri Bimes, ed. Michael A. Genovese, Encyclopedia of the American Presidency, p 262-63. ^ "Presidential Inaugurations Past and Present: A Look at the History Behind the Pomp and Circumstance". 2002-2009-fpc.state.gov. Retrieved November 7, 2012. ^ "The New Administration: President Arthur Formally Inaugurated" (PDF). The New York Times. September 22, 1881. Retrieved January 19, 2009. ^ "U.S. Presidential Inaugurations: John Quincy Adams". Web guides. Library of Congress. Retrieved January 29, 2017. ^ "U.S. Presidential Inaugurations: Theodore Roosevelt". Web guides. Library of Congress. Retrieved January 29, 2017. ^ "U.S. Presidential Inaugurations: Franklin Pierce". Web guides. Library of Congress. Retrieved January 29, 2017. ^ Usborne, Simon (November 16, 2013). "The LBJ missal: Why a prayer book given to John F Kennedy was used to swear in the 36th US President". The Independent. Retrieved June 15, 2014. ^ "President-elect Barack Obama to be Sworn in Using Lincoln's Bible". Presidential Inaugural Committee. December 23, 2008. Archived from the original on January 19, 2009. ^ Mettler, Katie (January 18, 2017). "The symbolism of Trump's two inaugural Bible choices, from Lincoln to his mother". The Washington Post. Retrieved January 29, 2017. ^ "Presidential Inauguration 2017". United States Marine Corps. Retrieved January 27, 2017. ^ "Gerald R. Ford's Remarks on Taking the Oath of Office as President". Gerald R. Ford Presidential Library and Museum. Retrieved November 18, 2008. ^ "Presidential Inaugurations Past and Present: A Look at the History Behind the Pomp and Circumstance". ^ "Newdow". "Appendix D: Inaugural Clergy" (PDF). ^ "Washington National Cathedral: Presidential Inaugural Prayer Services". Washington National Cathedral. Archived from the original on January 20, 2009. Retrieved January 16, 2009. ^ Michael E. Ruane (December 17, 2008). "Selection Provides Civil Rights Symmetry". Washington Post. Retrieved January 15, 2009. ^ Kelloway, Kate. (January 24, 1993). "Poet for the New America," The Observer. ^ Rosenthal, Harry (January 20, 1997). "Poet Addresses Inaugural Event". The Washington Post. Retrieved February 1, 2013. ^ Katharine Q. Seelye (December 21, 2008). "Poet Chosen for Inauguration Is Aiming for a Work That Transcends the Moment". The New York Times. Retrieved January 15, 2009. ^ Bruce, Mary (January 21, 2013). "'One Today': Full Text of Richard Blanco Inaugural Poem". ABC News. Retrieved January 22, 2013. ^ a b Foley, Thomas (January 25, 1973). "Thousands in Washington Brave Cold to Say Goodbye to Johnson". Los Angeles Times. p. A1. ^ a b "Marine Band Inauguration History" (PDF). Marine Band Public Affairs Office. Retrieved January 27, 2017. ^ Bendat, Jim (2012). Democracy's Big Day: The Inauguration of Our President, 1789-2013. iUniverse. pp. 106–108. ISBN 978-1-935278-47-4. ^ a b c Rossman, Sean (January 20, 2017). "From Washington to Trump: Inauguration firsts". USA Today. Retrieved January 27, 2017. ^ a b "Presidential Inaugurations: Celebrate New Times". The White House Historical Association. Retrieved January 27, 2017. ^ "1953 Presidential Inauguration". Eisenhower Presidential Library, Museum & Boyhood Home. Retrieved January 27, 2017. ^ Hauser (January 19, 2017). "The Inaugural Parade, and the Presidents Who Walked It". The New York Times. Retrieved January 27, 2017. ^ "The 40th Presidential Inauguration Franklin D. Roosevelt January 20, 1945". The Joint Congressional Committee on Inaugural Ceremonies. Retrieved January 31, 2017. ^ Knowlton, Brian (January 21, 2009). "On His First Full Day, Obama Tackles Sobering Challenges". The New York Times. Retrieved January 28, 2009. ^ I The Journal and Letters of Francis Asbury Chap. 18. ^ Vocal, Youth. "presidential inaugural committee 2017". Retrieved January 12, 2017. ^ MacNeil, Neil. The President's medal, 1789–1977. New York: Published in association with the National Portrait Gallery, Smithsonian Institution, by C. N. Potter, 1977. ^ a b Levine, H. Joseph. "History of the Official Inaugural Medal". Lori Ferber Collectibles. Retrieved January 27, 2017. ^ Levine, H. Joseph. Collectors Guide to Presidential Medals and Memorabilia. Danbury, Conn.: Johnson & Jensen, 1981. ^ Peters, Gerhard (ed.). "Inaugural Addresses (including length in words) Washington – Trump". University of California, Santa Barbara: The American Presidency Project. Retrieved August 3, 2017. 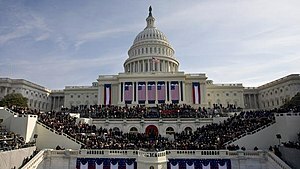 Wikimedia Commons has media related to U.S. presidential inaugurations.